Ready to spice up snack time? Cheetos Flamin’ Hot Asteroids and Flavor Shots are the newest poppable snacks that will bring a flavor boost to snack time. Snack time is getting a big boost from the past. Cheetos Flamin’ Hot Asteroids make a triumphant return to the snack aisle. Joining Cheetos in the Flavor Shots line are Fiery Habanero Triangles, Doritos Nacho Cheese Nuts, and Doritos Flamin’ Hot Nacho Cheese Nuts. These on-the-go snacks are definitely heating up snack time. Recently, Frito Lay has been offering all types of spicy-infused snacks. It seems that all types of snacks are getting a Flamin’ Hot boost of flavor. This heat driven food trend has taken over the snack aisle. People are craving heat, spice and bold flavors. Bland is boring. Snacks need to offer that in your face flavor that makes people go back for handful after handful. 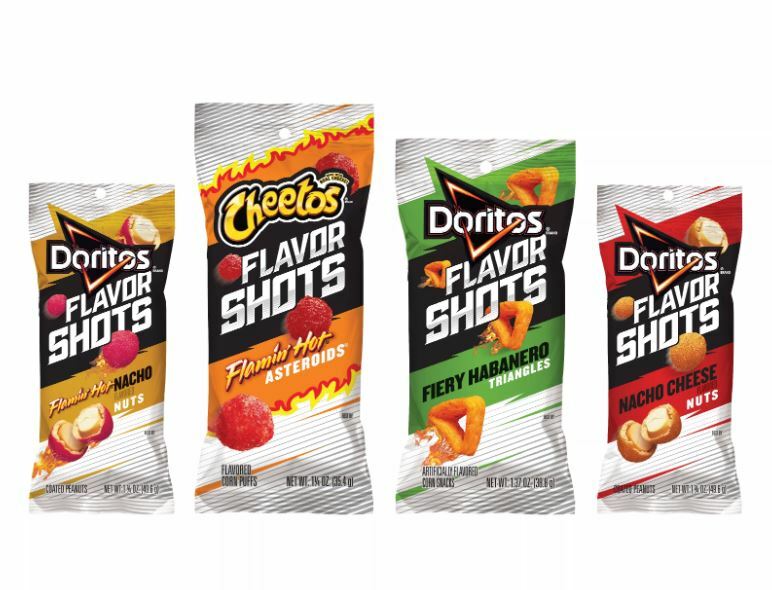 The launch of these heat-forward Flavor Shots is right on trend for Frito Lay. From the return of the Cheetos Asteroids to the new Doritos options, these grab and go snack bags fit in people’s busy lifestyles. From a mid-afternoon flavor boost to a school lunch boxes, these snack bags could become the next big snack trend. Regarding the Cheetos Asteroids, fans have been wishing and wanting their return. There is something craveable to the small, round, puff ball shaped snack. After being off store shelves for 10 years, this new version will have fans flocking to the snack aisle in search of the bold new flavor. Recently I had the opportunity to try the Cheetos Flamin’ Hot Asteroids. First, I am a big fan of the flamin’ hot flavors. There is nothing better than the mouth tingle that grows with every bite. For many people, a Cheetos crunch is very personal. Crunchy versus puffy can cause a huge debate. Since this snack is meant as a grab and go, or a handful snack, the small, puffy option is quite smart. The crunch is still apparent, yet the texture lets the flamin’ hot heat envelope your taste buds. Handful after handful, the heat grows to an explosion of flavor. These new Flavor Shots are an expansion to the Frito Lay grab and go line. Previously, Doritos launched Doritos Crunch Mix and Crunch Nuts. People often like this type of single serve snack option. It does offer both convenience and portion control. When a person finishes this bag, there is less guilt than finishing a big bag of Cheetos. The new Flavor Shots and Cheetos Flamin’ Hot Asteroids are available nationwide. The suggested retail price is $1.19.